Crème renversée au caramel is known more commonly as Crème Caramel, which is a custard and caramel dessert. 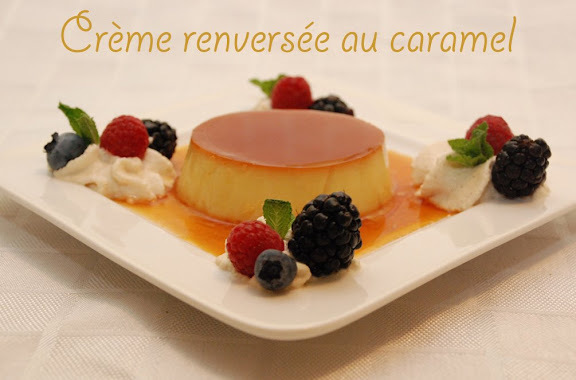 Renversée means inverted or upside down and refers to the fact that this dessert is unmolded for service and the caramel from the bottom of the ramekin becomes the sauce for the custard. You can also make a Crème renversée without the caramel, but why miss out on this deep flavor that complements the custard so well? Crème Caramel used to be THE dessert I would look for when I was out for dinner. If it wasn’t on the menu, I was disappointed. That was, until I learned how easy it is to make. From four simple ingredients, comes this elegant, delicious and heavenly dessert. Also, after doing the math I found out that it costs me 32 cents for each ramekin (I made 7) to make this dessert and the restaurants charge between $7-9! That’s motivation to learn how to make it! Crème Caramel, according to Wikipedia, may originate in the Southern regions of France, but it’s also a popular dessert in many other countries such as Japan, Argentina, Uruguay, and the Philippines to name a few. It’s often known as a flan. However, according to Cook's Illustrated, a flan contains more eggs and yolks, and either cream, evaporated milk, or condensed milk. The custard part of this dessert is part of les entrements, in French, meaning desserts made of milk, eggs, and sugar that are served cold. 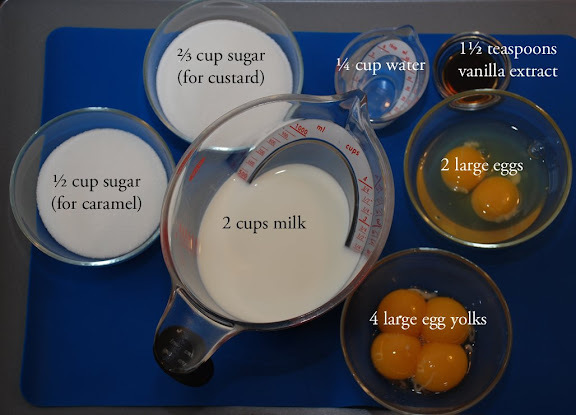 Milk (I used whole milk, but you can mix milk with light cream) and whole eggs are thickened with heat in the oven. Thickening occurs at a temperature between 180°-190°F. The whites of the eggs help set the custard, and the yolks make it creamy. A quiche is also a custard, but once you add sugar and vanilla, the custard becomes a sweet and yummy dessert. When you’re blending the custard, you shouldn’t whisk in too much air or else there will be a lot of foam on top of the custard mixture. Let the custard mixture sit for a bit for the foam to subside. You can also skim off the foam. All sorts of flavorings can be added to the custard such as chai tea, cinnamon, coconut, ginger, lavender, lemon, maple syrup, mocha, orange, or strawberry, but traditionally just vanilla is added. If you add a flavoring that is acidic (such as orange juice), the custard with curdle. Custards, if overcooked, taste “eggy”. It should taste rich and creamy, but not too heavy. Often, Crème Caramel is made in individual ramekins, but you can make a large version in a pie pan or soufflé dish. The caramel part of this dessert can be tricky. Even though caramel contains two ingredients: water and sugar (and sometimes just sugar is used), too many things can go wrong. 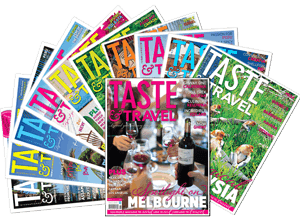 It has been called the most dangerous thing to make in the kitchen, according to food blogger at Eggbeater (and quickly becoming one of my favorite food blogs) writing at this link. When making caramel, I have always put the sugar and water in the pan and left it alone to do its thing. I don’t cover the pan or brush down the sides or stir the sugar and water mixture, and I’ve never had problems. Once it starts to turn color, though, it requires babysitting since it can go from a nice light golden color to a burnt state faster than bad news. When you start to see some color, start swirling the pan to distribute the color. Also know the color of your pan is dark, making the caramel look darker than it is. Be bold, and hang on or test some on a white ramekin to see the color. I’ve seen too many Crème Caramel desserts that look pale! If you carefully add water (about 4-5 tablespoons) at the end of the caramelization, the cooking will stop and the caramel won’t harden as quickly making it easier to pour into the ramekins. You must watch though, because the water will sputter and you could easily burn yourself. David Lebovitz, another great food blogger, suggests using a mesh strainer over the pan while pouring in the water. Let the caramel cool and harden before adding the custard. Again, I learned this the hard way as I poured in the custard and saw the caramel start to mix with the custard. Oh well, another one for the “chef”. Crème Caramel is baked in a water bath (bain marie) to prevent the outside of the custard from cooking or drying out before the interior is cooked. The water bath maintains a low, even, moist heat. The water in the water bath must not boil or the custard will be grainy. But it must not be too cool or the custard will take too long to cook. It should have small bubbles. When you put the ramekins in a pan that will hold a water bath, make sure the pan you use doesn’t have holes! I learned this the hard way by using an aluminum foil pan that I’d used for a different dish that had a small hole in one corner. Soon I had a puddle of water gathering in the oven. I also put a dish cloth in the bottom of the pan so that the ramekins don’t slip around. Also, if you’re baking Crème Caramel in individual ramekins, you can shorten the baking time. After baking, it should be a little jiggly in the center, since it will continue to cook after it is out of the oven. When unmolding, you can heat the ramekins on a burner on the stove (just for a bit) to loosen the caramel to make sure it won’t stick. Use a knife to loosen the edges before unmolding too. This is still one of my favorite desserts. The only problem with knowing how to make it at home is that there's a temptation to make it too often! So much for the diet. Definitely another keeper in the favorite file. One question: does it taste as delicious as it looks? I have never seen a more beautiful presentation! Wonderful photo. This is a very detailed, very helpful blog. I loved the video links. It looks incredible. Mmmm I want to eat some right now. I am going to make it after work. I am also always disappointed if it isn't on the dessert menu. It doesn't sound so hard now that I read your recipe. My very favorite dessert. Maybe I'll even try it now. Love your new blog, good luck with it. 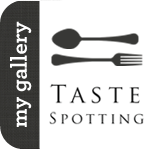 lynda and doreen - Thank you for reading the blog and your compliments! We tried this yesterday and it turned out beautifully! The taste was mellow and the texture was smooth -- with no air bubbles. Beautiful! Had trouble getting the carmelized sugar to be as rich and amber colored as yours. Need more practice. The tips were excellent. THANKS. We will try it again soon. anyway, i hate the smell of eggy in custard..
how to dispel the smell?? Xiao Cha Bo - The proportion of egg whites and yolks is important. I found this recipe didn't taste eggy. your tips were helpful as my caramel worked out the 2nd time round. however after chilling the custard in the fridge, parts of the caramel solidified. how do you maintain so that the caramel is still flowy like when it first comes out from the oven? thanks!